I thought it was about time to play catch-up on my blogging which has been lacking as of late. Between full time work, training, and a “side business,” there is not a lot of down time nowadays to sit down and write. The Patriot Half is in exactly one month from today. How is training for that, you might ask? I’m feeling mostly confident with the bike. 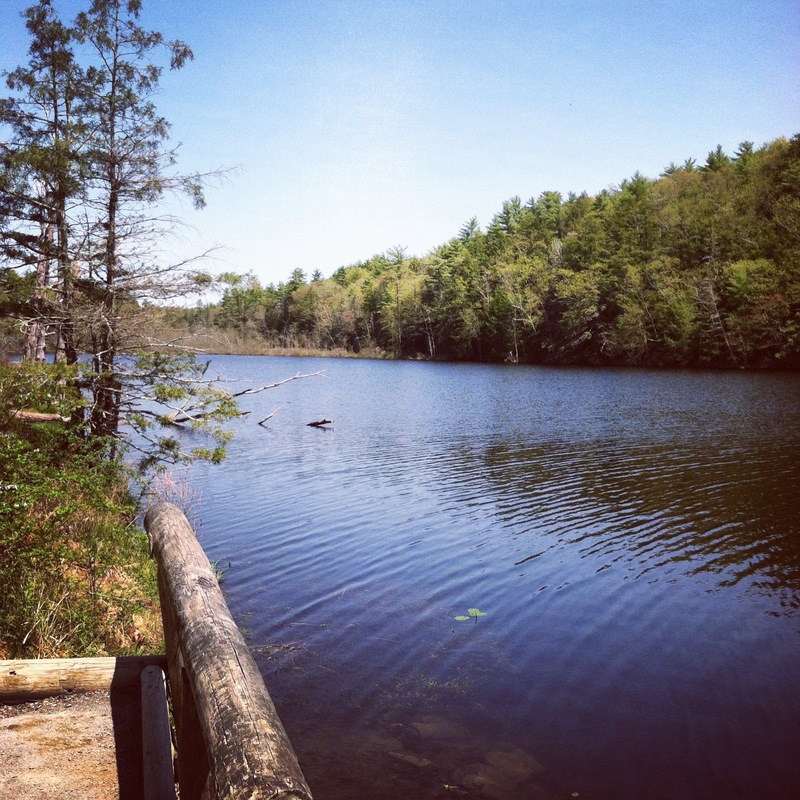 My LSD rides have been up in the Catskills mainly, so I feel all the climbing will be to my benefit. I already know riding 50+ mile rides makes my 25mile ride this week feel like a walk in the park. I guess my perception of long distance rides has changed when training for this. I am more than thankful that the weather is turning nice and perhaps the wind might be calming down for awhile. 95% of my long rides have been in horribly windy conditions, testing me physically and psychologically. My coach told me riding in the wind was good because of exactly that: it prepares you for potential race day conditions. 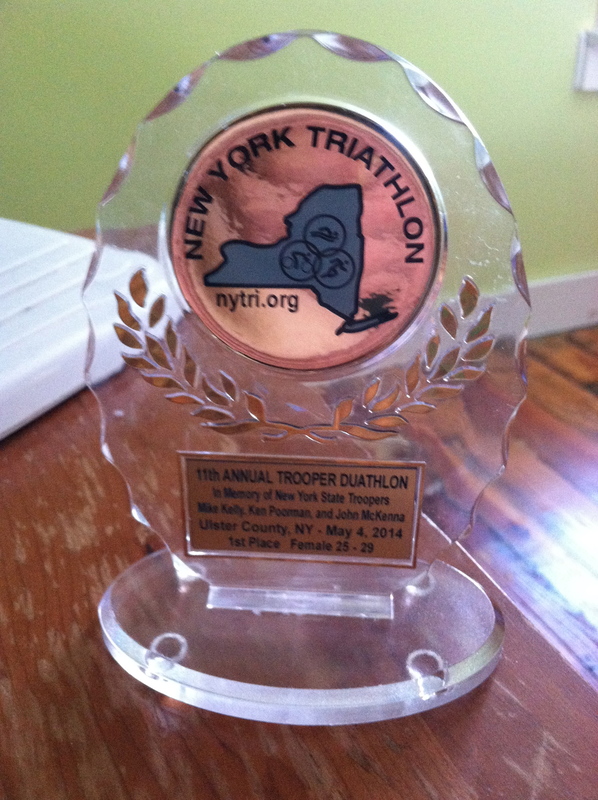 Wouldn’t you know, last weekend’s Trooper Duathlon took place on a morning where the wind was fierce. So bad, they had to take down the race banner and tent because they kept blowing over. I remember asking myself why I was doing a duathlon in less than ideal conditions. I’m not sure what the answer is, maybe because I paid to race in it? It was the first time I have completed this race as an individual and not as part of a relay team since 2011. It was not as bad as I thought it would be. Having no expectations for yourself race day helps. I’m familiar with the race course, and racing up Dug Hill is always a pleasure. 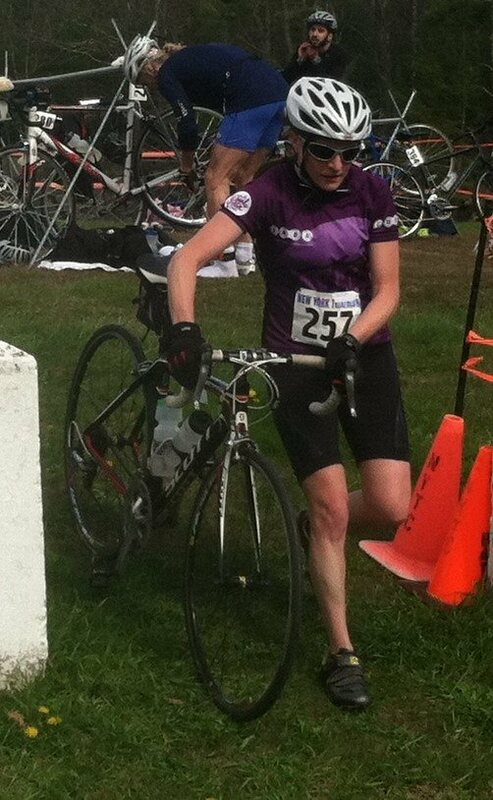 From the Trooper Duathlon…Ohh how I long for a Tri bike…. Running has been good. I know I am capable of running a half marathon; I’ve already completed two this year. After swimming and biking? Yeah, I am pretty sure it is possible. 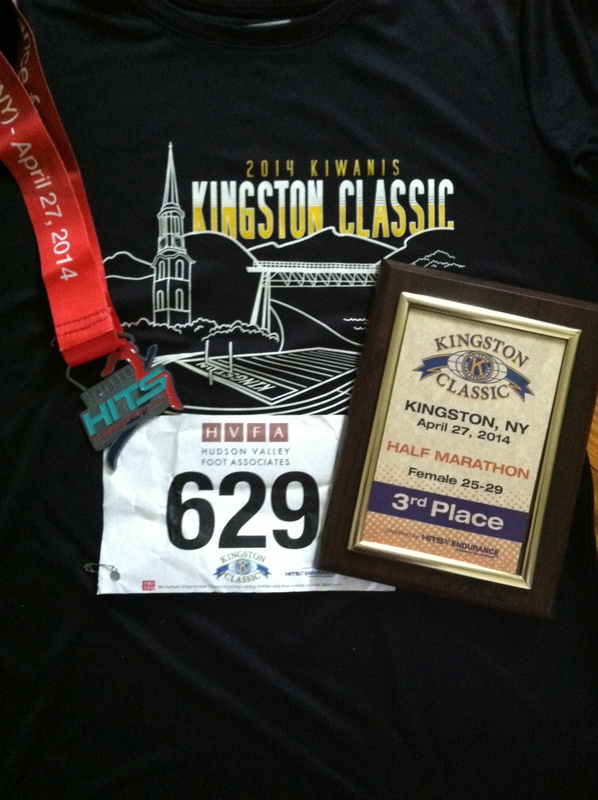 A couple weeks ago I managed to get third place in my age group in the first Kingston Kiwanis Half Marathon in a town close to home. I never thought I was a good runner for some reason. I guess training is paying off?!? Despite starting at a wickedly early time (who starts a half marathon at 7am?!?) 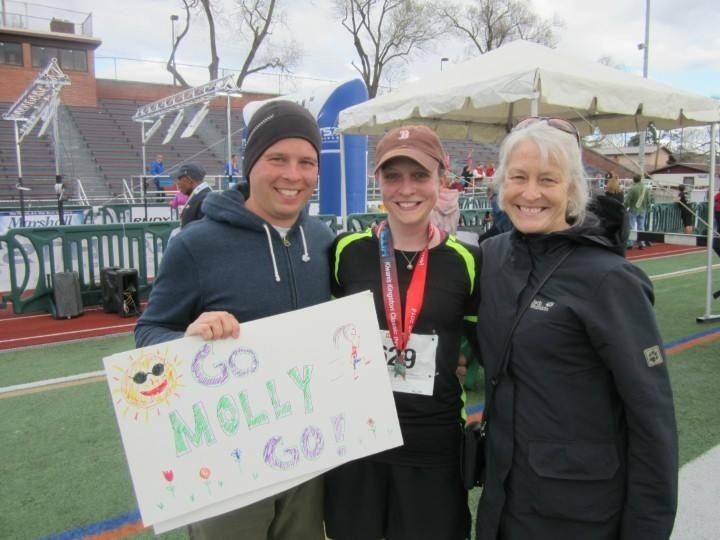 it was a nice race, mostly because I had people along the course whom I knew, and it was close enough for family/friends to come. 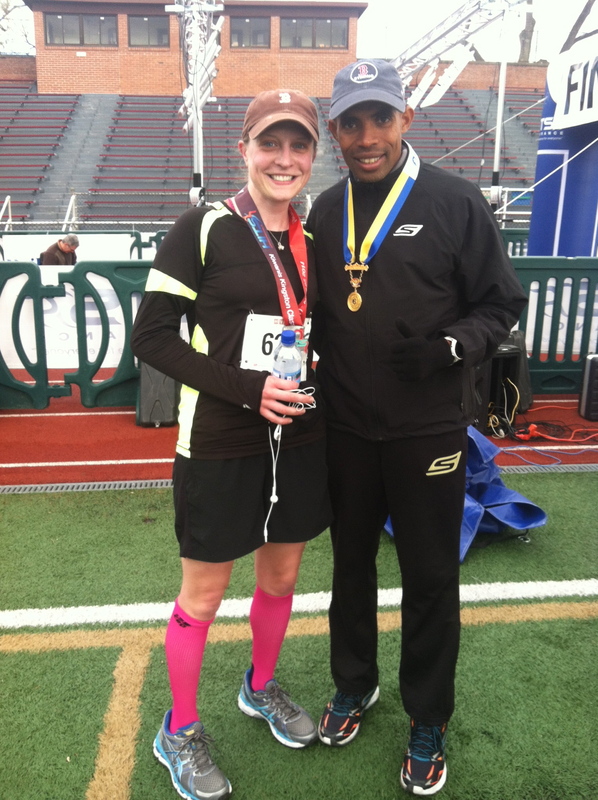 We cannot forget that Meb Keflezighi was there too, which made the experience even more special. Swimming. Ah, swimming. Pool swims have been going well. I’ve seen myself improving. What about OWS you might ask? I tried on a new wet suit the other day and decided to go for a swim. Long story short, I am not sure if I will be doing this race in a wetsuit. I despise wetsuits. The panicked feelings of claustraphobia in one are not fun. It reminded me of the feelings from a couple years ago when I attempted Mooseman. I know they give you buoyancy while in the water, but is the added fear of not being able to breathe worth it in the end during the race? A difference in my training in open water and the race is, there will actually be people out in the water during the race who will be able to help me incase I have trouble swimming. Now, my swims in open water have been solo. So, why use a wetsuit? (Maybe any of you triathletes out there might be able to have an answer for this).